Data center service provider improves B Corp assessment score while making green improvements across the organization. Successfully recertifying as a B Corp and improving our score is valuable feedback that our efforts to treat the planet, our employees, and the community with respect are working. Green House Data, a nationwide data center service provider offering cloud hosting, colocation, and managed IT services, has successfully recertified as a B Corp, meeting and improving upon rigorous standards of social and environmental performance, accountability, and transparency. The recertification comes as the company completes a push to be greener in offices and business operations across the country, including new reporting and tracking of emissions in an annually published sustainability report, the purchase of trees for every piece of promotional material purchased, and strict office policies to reduce waste. “Successfully recertifying as a B Corp and improving our score is valuable feedback that our efforts to treat the planet, our employees, and the community with respect are working,” said Green House Data CEO Shawn Mills. B Corps are certified by the independent non-profit organization B Lab with the dual purposes of accountability and a movement towards business as a force for good in the world. There are over 1,800 B Corps from a diverse marketplace of 130 industries. Green House Data improved nine points on the assessment since the company was originally certified in 2014. The increased score was largely due to new tracking practices for greenhouse gas emissions, as well as increased transparency in management. 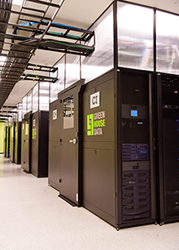 The data center industry has come under fire for significant energy consumption, but Green House Data joins large-scale providers like Microsoft and Google in the purchase of green energy and pursuit of highly energy-efficient operations. With electricity-saving measures like aisle containment and the use of ambient air instead of chemical air conditioning, Green House Data facilities operate up to 40% more efficiently than the industry average. The company has also been recognized by the EPA as a Top 30 Tech & Telecom green energy purchaser. In 2015, Green House Data purchased over 15 million kilowatt-hours of Renewable Energy Credits. With data center facilities and cloud installations across the country, Green House Data provides cloud hosting, colocation, disaster recovery, and managed IT services throughout North America. Companies of all industries and sizes, including healthcare, legal, MSPs, energy, and retail, choose Green House Data for custom infrastructure design and Hear from a Human Support. The company is a certified VMware provider, SSAE 16 Type II and HIPAA compliant, as well as a B-Corp and EPA Green Power Partner. Visit http://www.greenhousedata.com to learn more.